We operate by our body clocks. We were up at the usual early hour, but lost an hour to the Michigan time change. It seemed strange that the sunrise was just after 7am, but we enjoyed watching it from our beach just the same. Today we cycled coast-to-coast across the Keweenaw Peninsula and then up the eastern shore to Houghton. There is not a lot of population on the peninsula, so I decided to focus my camera on the beauty of the nature we encountered along the way. 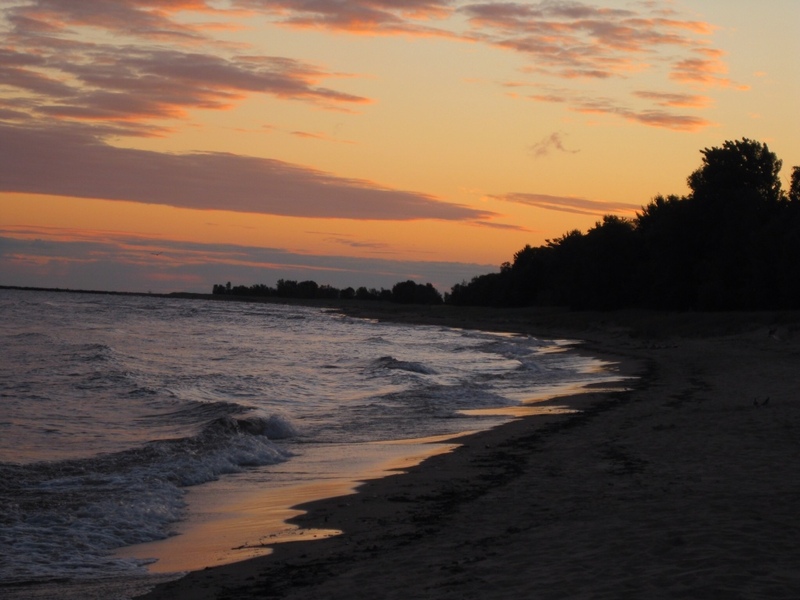 Sunrise over the western shore of the peninsula at Ontonagon. 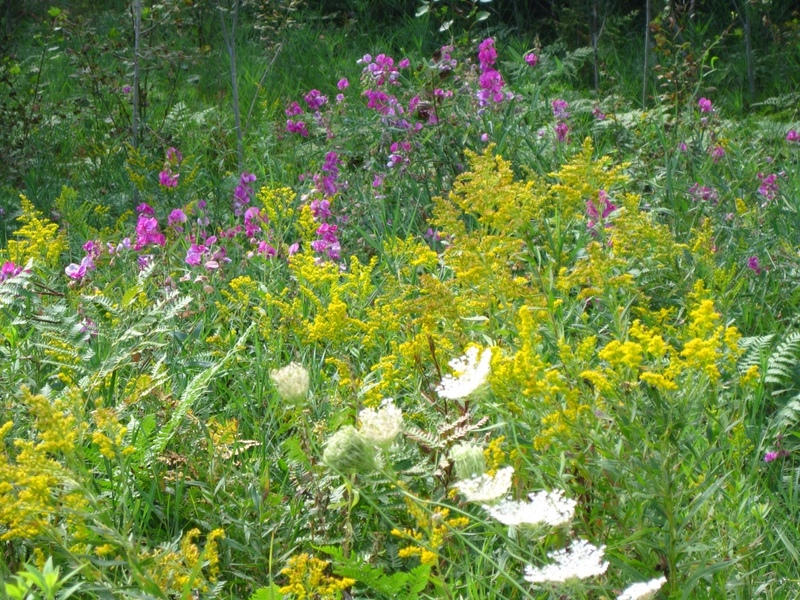 We have been enamored with the windflowers blooming along the roadside throughout our trip. My favorite are the purple blossoms. 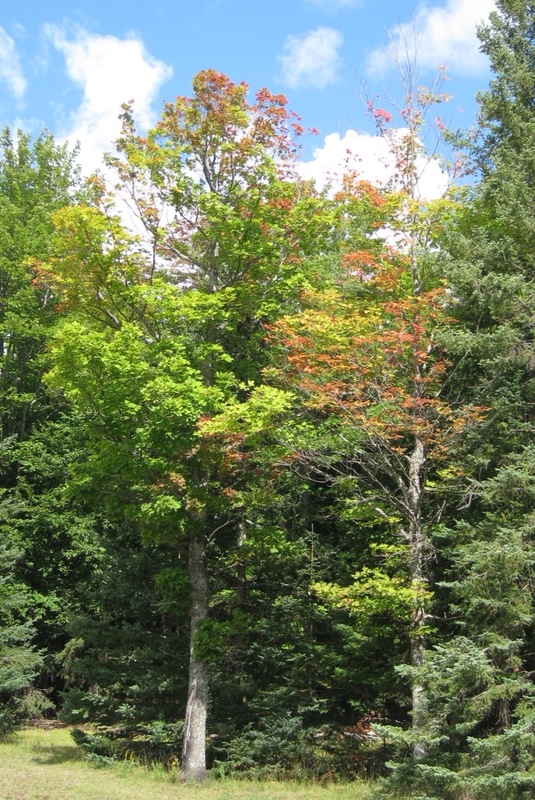 Fall colors are definitely beginning to show in the maple trees. 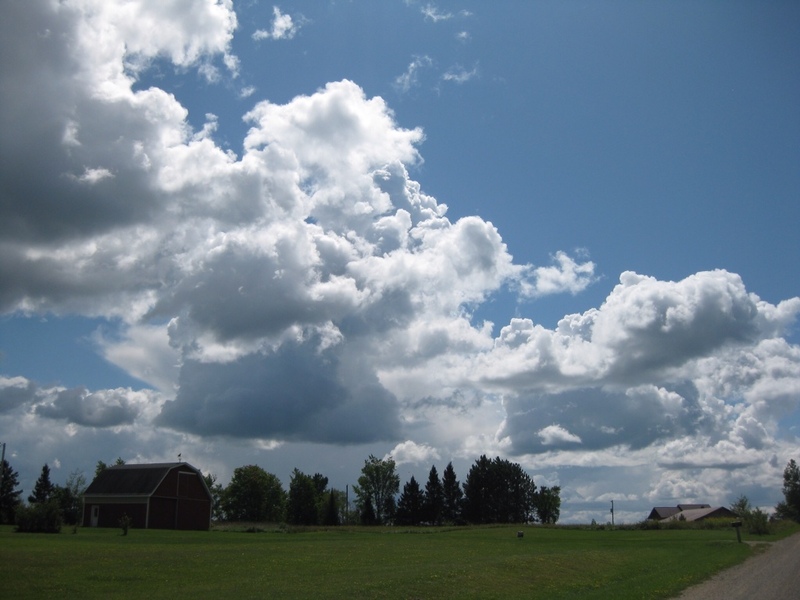 Fantastic clouds formulate over pastoral farmland in the interior of the peninsula. 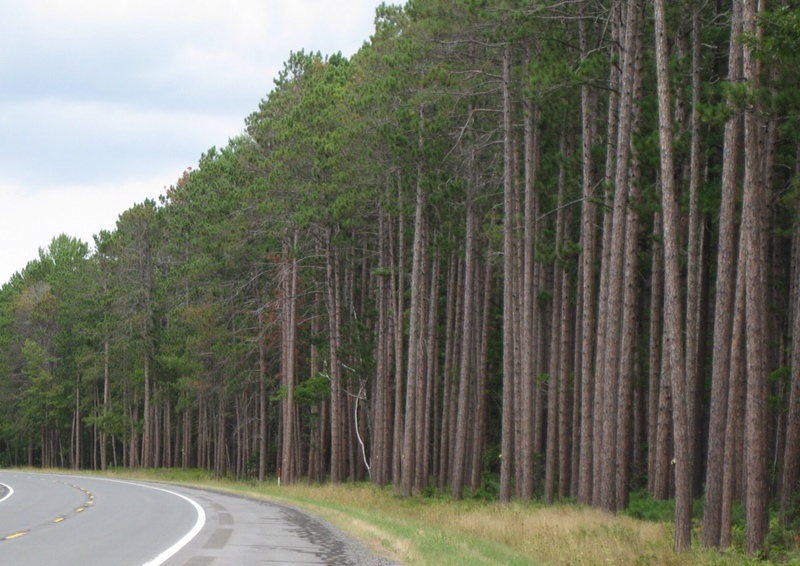 Tall pine trees line the road going north from Baraga to Houghton. 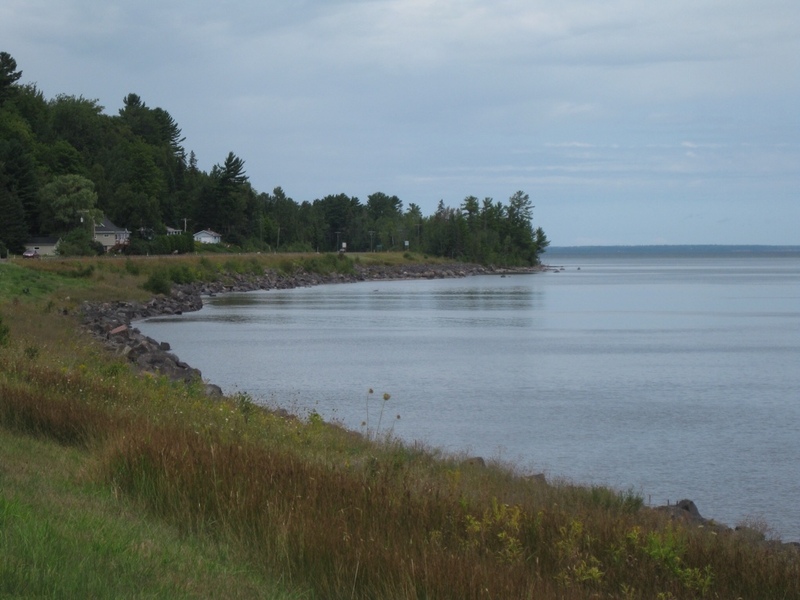 The eastern shore, cycling along Keweenaw Bay. We experienced another aspect of Mother Nature as well today. After having been blessed with sunshine throughout our trip so far, our luck ran out less than 20 miles short of our final destination. We thought we had out-biked the rain, leaving a few thin showers behind us, but that was nothing in comparison to the squall that slammed into our path. Within a matter of minutes, the temperature plummeted, sheets of rain came pouring down and gusts of wind blew right into us. Fortunately, Rich spotted a thick grove of pine trees across the road. We dashed over there and huddled in the relative protection of the trees waiting for the rain to subside. I was amazed at how well sheltered we were in comparison to the torrents falling on the road. The rain did indeed abate allowing us to resume our ride, although it was wet and chilly cycling (Rich called it “miserable”) and semis showered us with roadspray. Then just as suddenly the sun returned. The amazing warming power of the sun was such that when an ice cream stand materialized on the side of the road, we didn’t hesitate to stop. Two huge blackberry smoothies were happily consumed as we parked ourselves on a picnic bench and basked in the sunshine. Mother Nature wooed us back into her good graces that easily. 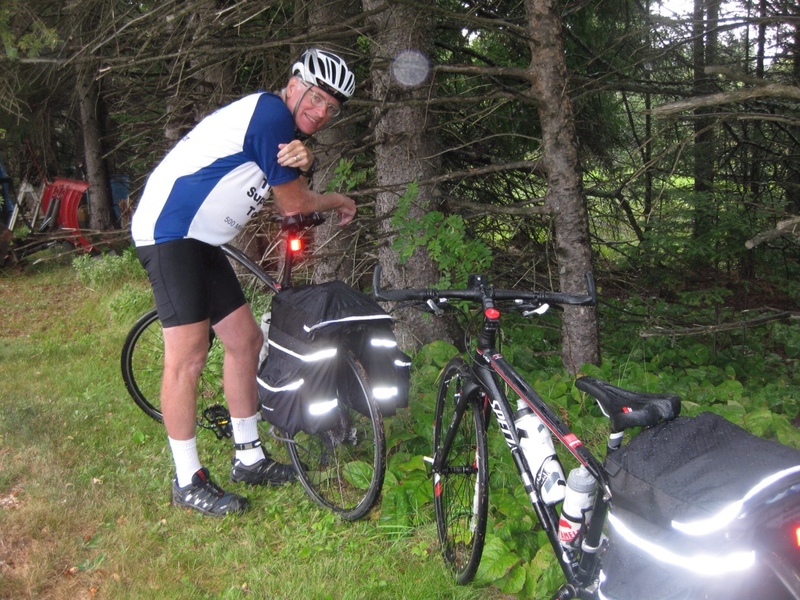 This entry was posted in Keeping Fit, Travel and tagged Cycling, Outdoors, Trans-Superior Cycling Tour, Travel, Upper Peninsula by Molly. Bookmark the permalink.